Benjamin was absolutely amazing.. Our event was last minute and he was able to perform within only a couple days notice. The weather was starting to threaten a cancel but he was able to quickly come up with a solution so that we could still have him perform! The fire show was a perfect end to our corporate event, highly recommended! 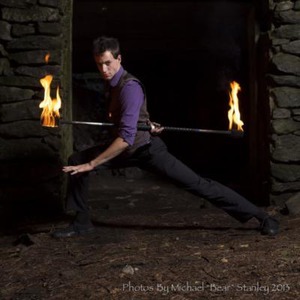 Wonderful fire and circus performer for our major outdoor festival. Outside the Box was happy to have him and will see him again soon! Benjamin performed at my daughter's sweet 16 party, which was an outdoor nighttime event. His show is amazing - he is truly talented and his act is quite entertaining. He communicated information to me effectively as we prepared for the event. Benjamin is also very good at engaging the crowd - the banter was entertaining and the group, mostly teenagers but included some adults and smaller children, all loved the show. Some of the kids wanted to take pictures with him afterwards. He also asked me permission to do certain parts of his act in case I had any reservations - I didn't and I was not disappointed. I absolutely recommend him. Benjamin was incredibly professional and accommodating. Our request was very last minute but he still was able to work it into his schedule. We would recommend Benjamin for anyone who wants to take their event to the next level. Benjamin has been a great additional to our event, and we're excited to continue our work with him in the future! Great performer, extremely professional, and refreshingly flexible! I was very happy with Ben's performance, his enthusiasm and professional attitude. Communication was quick and seamless, and the performance itself was outstanding. I was unsure of what to expect but was very happy with how excited the students were, and I was impressed with the variety in Ben's show. It was a great way to draw people to the event who may have not been as invested in the athletics portion but still wanted to experience the night. I would absolutely recommend Ben to a friend who is looking for this type of engaging performance. Wonderful Event! Great talent and very easy to accommodate all special requests! Thank you! Benjamin Reynolds was very polite, appreciative, and professional. We had a few technical difficulties, along with Mother nature making her presence known, and Benjamin was flexible with his performance and made it work. He gave people a great show, was very charismatic, and drew the crowd into his performance. I was definitely pleased with both his talent and the way he handled the situation. It's fun to watch him perform because you can see his passion- he likes what he's doing and we love for people to witness that during a special performance. I heard nothing but positive feedback from our guests and I know his performance added to the enjoyment of their visit. Not only did Benjamin come and give us all he promised...but he did so in the midst of hurricane Arthur. Our power was out at times, venues were switched, and with each new challenge, Benjamin was both professional and brought an incredible show each time that left people talking! I highly recommend this act! Ben is a pleasure to work with, and an incredibly engaging performer. Benjamin was very professional. Always on time for each performance and very accommodating with our hectic schedule! In terms of talent, we found he was a great performer. We were very happy to have had him perform for our event season!